A Day In My Life...Crochet & Reviews: Do you recycle yarn? I don't have a project for you today. There is one on my hook but thats a surprise. The reason for this post is about all the yarn that can be unraveled and used again. One day last week I was at our local clothing and food pantry and I found this little square. Its not the prettiest colors but I decided to unravel it anyway. The square was about the size of a cushion on your couch. 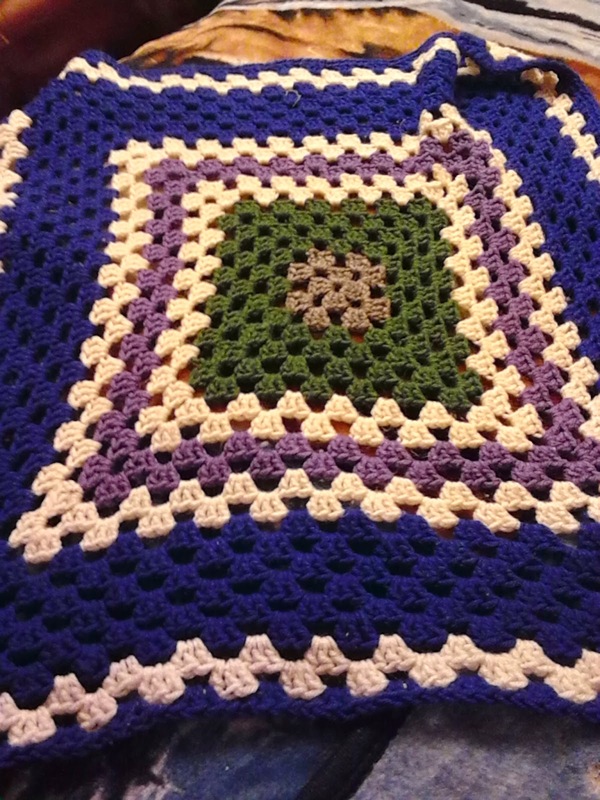 It has a little gray middle, some moss green, cream, white, purple and blue. Once I got it all unraveled (make sure you pick a fairly new afghan or it wont unravel or the yarn will knot and break). All in all I got 3 big balls of blue, 3 balls of cream and half ball of purple. Not a bad haul for something that was unloved and in a bin all by its self. If you can't afford to buy yarn this might be the way to add to your yarn stash. Its best to recycle anyway! Please do this when you can. it keeps the yarn reused. People who can't buy it can use it this way, if you are desperate you can even reclaim sweaters and old afghans laying around. I got around 10 balls of yarn from just this little chair cover. If you dont like it, tear it out, make it new! Yarn loves to be made into many special things. My win from Here We Go Again, Ready?